One of the top Caribbean countries to buy property in, the islands of Bahamas are defined by two key attributes: their spectacular beauty and their strategic location. Just 50 miles off the Florida coast, Bahamas is comprised of 700 islands scattered over 100,000 square miles of ocean. The breathtakingly beautiful archipelago is an ecological oasis featuring 2,000 stunning islands and cays and boasts the clearest water on the planet – with a visibility of over 200 feet – as well as dazzling white and soft pink beaches. Being graced by stunning scenery, Bahamas is home to some of the world’s best diving, snorkelling, boating, fishing, kayaking, island-hopping and beachcombing. Then consider the tropical climate that is beautiful year-round, the rich history and culture, and the friendly people. No wonder these paradisiacal islands have become a tropical vacation hotspot for luxury property buyers from all around the world. Bahamas’ longstanding political and economic stability and highly respected judicial system are important assets prized by international property buyers, making the Caribbean nation an increasingly preferred holiday home destination. An English-speaking country that gained its independence from Britain in 1973, Bahamas is one of the most politically stable countries in the world, with a parliamentary democracy that has operated without interruption since 1729. Bahamas is one of the wealthiest nations in the Caribbean, and the economy has been undergirded by sound economic, monetary and fiscal policies. Tourism, banking and financial services are the major driving forces behind the Bahamian economy. Well-established banks that include Barclays, Citibank, RBC Royal Bank of Canada, and CIBC do business here. The country is FATF-compliant, meaning it meets worldwide standards for cracking down on money launderers. The Commonwealth of The Bahamas has also one of the world’s fastest growing ship registries. English Common Law forms the basis of the judiciary system although many Bahamian statutory elements have been added over the years. The country’s Supreme Court is the main court of the land, although its decisions may be appealed and final appeals are still able to be presented to the British Privy Council in London. The very favourable tax regime also contributes to growing interest amongst foreign real estate buyers in Bahamas. The country is an attractive tax haven for foreign nationals. There are no taxes on income, sales, estates or inheritances and there is no capital gains tax on real estate. A home-owner’s residence card, which is renewable annually, is available to foreigners owning property in Bahamas. Those buying property valued at 500,000 USD have priority in the permanent residence application process. However, neither permanent nor annual residence gives a foreigner the right to work in the country. The capital, Nassau, is a leading offshore financial centre. It enjoys all of the modern banking infrastructure and is fed by a pool of skilled banking, finance, business management, law and accountancy professionals. One may expect all of the amenities that are the hallmark of a sophisticated business hub, ranging from the latest telecommunications systems to top-rated schools and medical services. There are world-class hotels and casinos (including the dazzling Atlantis Resort with the world’s largest outdoor aquarium and a fantastic water theme park), clubs and great restaurants, top-of-the-line duty-free shopping, championship golf courses, tennis courts, marina facilities and every imaginable watersport activity. It is not surprising, therefore, that Nassau (on New Providence Island) and nearby Paradise Island, which are connected by two bridges, offer some of the most coveted real estate in the world. For those seeking an idyllic waterfront lifestyle, New Providence and Paradise Island offer the widest choice of residential properties in Bahamas. Many of those properties are very upscale, with a plethora of grand estates, luxurious tropical hideaways and beachfront villas. The other islands of the Bahamas are called “Out Islands” or “Family Islands”. 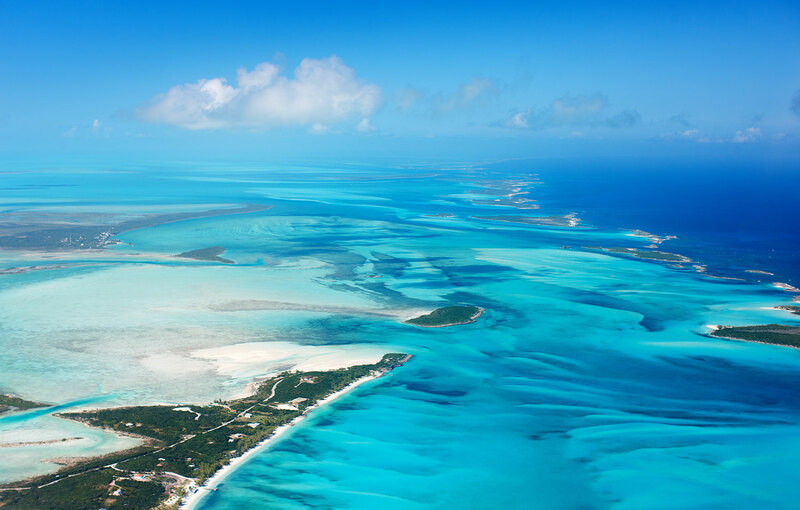 They include the second most populated island, Grand Bahama, as well as the Abacos, the Exumas, Eleuthera, Bimini, Andros, Cat Island, San Salvador and Long Island. Bahamas is easily accessible by air, with multiple flights from the U.S., Canada and Europe. Bahamas counts many internationally known business people as well as entertainment and sports stars amongst its year-round residents or owners of second homes. Residents include the Bacardi Rum family and Sir John Templeton of Templeton Investment Fund and the Templeton Award. Both operate their international empires from the Bahamas. Amongst those who have second homes at the exclusive Ocean Club Estates on Paradise Island are sports figures Barry Bonds, Michael Jordan, Ernie Els and Jim Courier. Amongst those owning property in Lyford Cay are Sean Connery, Tony O’Reilly, Sheila Hailey and members of the Goulandris shipping family. Americans are most numerous amongst expat property owners, although the number of wealthy investors from Canada, the UK and France is increasing. The vast majority of property investors buy on New Providence and Paradise Island, which are ideal as a vacation or retirement destination for someone requiring access to all of the modern services and conveniences. Property in Bahamas includes some of the finest real estate in the Caribbean such as spectacular waterfront homes, private islands for sale and luxurious condos in beachfront resorts. It is easy to see why Bahamas real estate is so popular. The islands offer easy access, a high standard of living and privacy to those wishing to keep a low profile. The islands are widely coveted amongst those who wish a second home or a vacation home in a tropical paradise. Read more about Bahamas in THE ADDRESS Magazine.